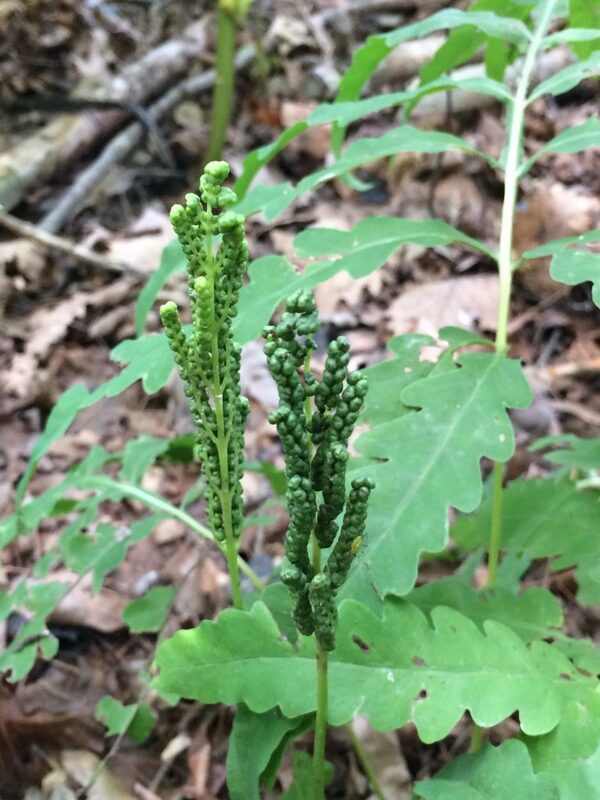 Onoclea sensibilis leaves and fruiting stalks (sporophylls). © W. John Hayden. facultystaff.richmond.edu (Accessed 3/2014). 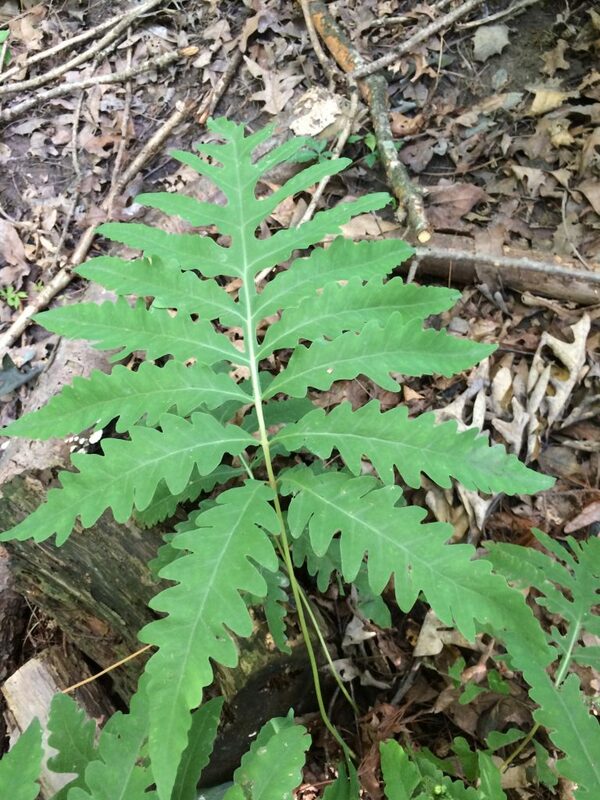 Onoclea sensibilis is a fern from a creeping, branching, rhizome, colonial; roots associated with vesicular-arbuscular endomycorrhizal fungi (Berliner and Torrey 1989). Leaves deciduous, arising singly or few together along rhizome, to 1 m long, blade 20-60 cm long, 15-35 cm wide, bright green, sterile blades pinnate leaflets opposite, up to 12 pairs (Del Tredici 2010), lower leaflets often broadly toothed or lobed; midrib winged. 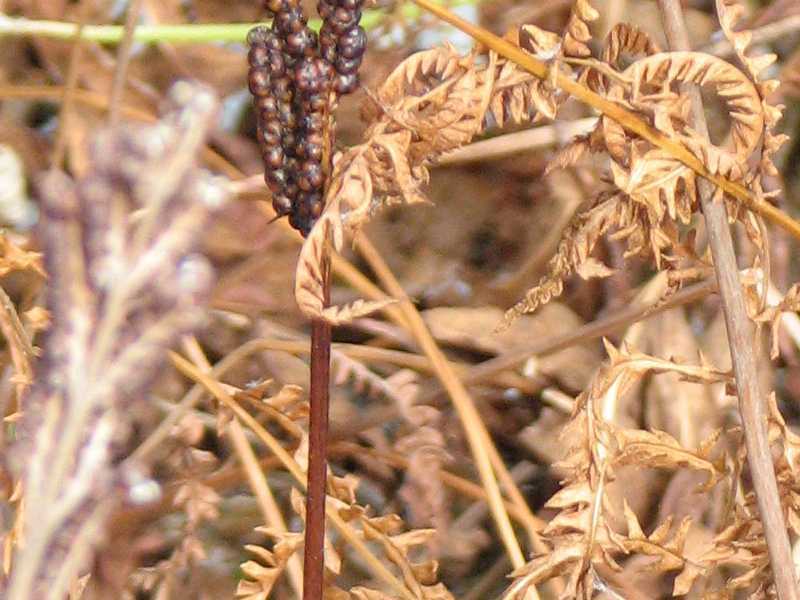 Spore cases bead-like, replacing leaflet lobes on stiff, shorter fertile leaves to 17 cm long, green, July-Aug, turning dark brown, persistent through winter. Habitat: Open, or bright, wooded swamps and wet areas, neutral to subacid soil, but noted growing under Ilex opaca (American holly) in fairy deep shade (Gargiullo, personal observation). Onoclea sensibilis winter sporophyll and old leaves. cod.edu. imgarde.com (Accessed 8/2017). Notes: Fronds eaten by some insects, wither quickly in drought or frost. Noted to be toxic to horses (Kingsbury 1964). A host of the white-spored fir rust fungus Uredinopsis mirabilis (a fir-fern rust, Basidiomycotina) (Sinclair et al. 1987). Quite tolerant of open, disturbed sites if soil is wet.